As you can see from the preceding syntax, after naming the table, you define each columnin orderwithin parentheses. Each column and description should be separated by a comma. Should you choose to create indexes at this time, you can add those at the end of the creation statement (you can add indexes at a later time, as well). (Prior to MySQL 4.0.18, you have to use the word TYPE instead of ENGINE). If you don't specify a storage engine when creating tables, MySQL will use the default type (InnoDB on Windows, MyISAM otherwise). I'll now create the four tables that compose the accounting database. It'll be easier to create the tables if you select the database first. You will need to be logged in as a user that has permission to create tables on this database. Figure 4.8. The first steps I take are to log in to mysql and select the accounting database. Create the invoices table (Figure 4.9). 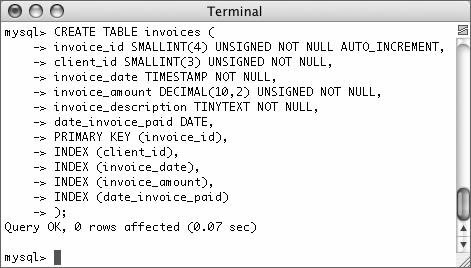 This step takes the information about the invoices table I established earlier and integrates that within the CREATE table syntax. The order in which you enter the columns here will dictate the order the columns appear in the table. You'll also need to specify any indexes last so that they are enacted after the column itself has been created. Figure 4.9. 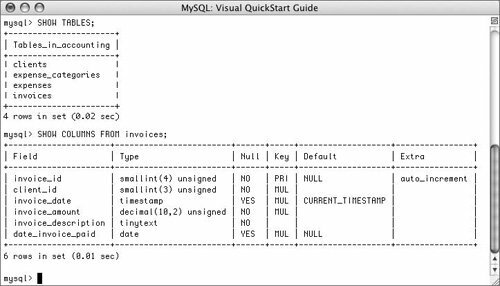 The mysql client allows you to enter commands over multiple lines, making long SQL statements more readable. 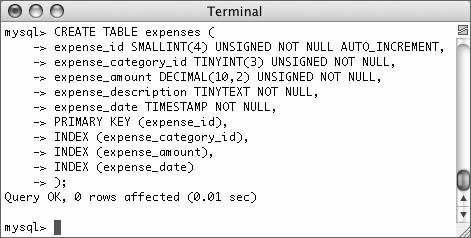 Because the mysql client will not run a query until it encounters a semicolon, you can enter statements over multiple lines as I do in Figure 4.9. Create the clients table (Figure 4.10). This table has the most columns but only two indexes. Figure 4.10. MySQL will report if a command worked, using the Query OK statement as indicated here. Create the expenses table (Figure 4.11). Figure 4.11. Creating the third table. Finally, create the expense_categories table (Figure 4.12). This is the simplest of the four tables, with only two columns and two indexes. Figure 4.12. Creating the fourth and final table. Confirm the existence of the tables (Figure 4.13). The SHOW command can reveal the tables in a database or the column names and types in a table. Figure 4.13. You can confirm the existence and structure of databases and tables using the SHOW command. Don't be alarmed by the results of the SHOW COLUMNS command. MySQL has its own way of describing a table that might differ from how you created it. DESCRIBE tablename, which you might see in other resources, is the same statement as SHOW COLUMNS FROM tablename. You can also run a SHOW CREATE TABLE tablename query to see how an existing table was created. 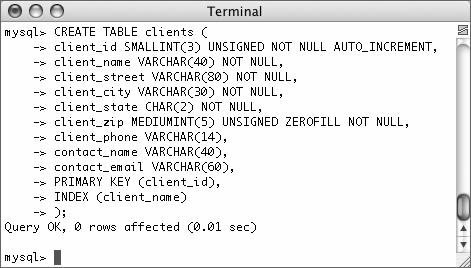 If you run a SHOW CREATE TABLE tablename query after making a table, you'll see how MySQL implements your creation. 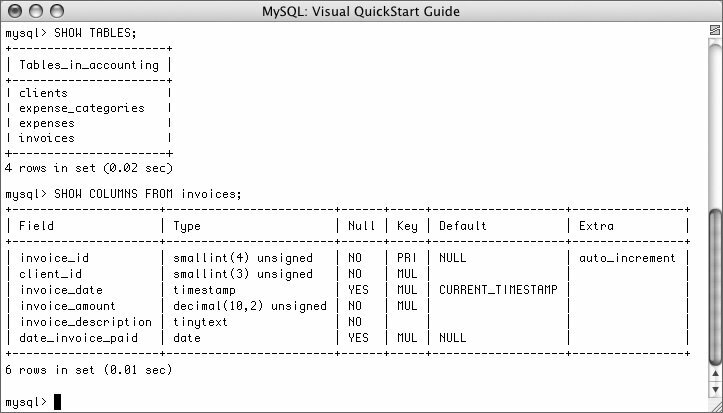 Doing so will help you see how MySQL may change column types for its own performance purposes.